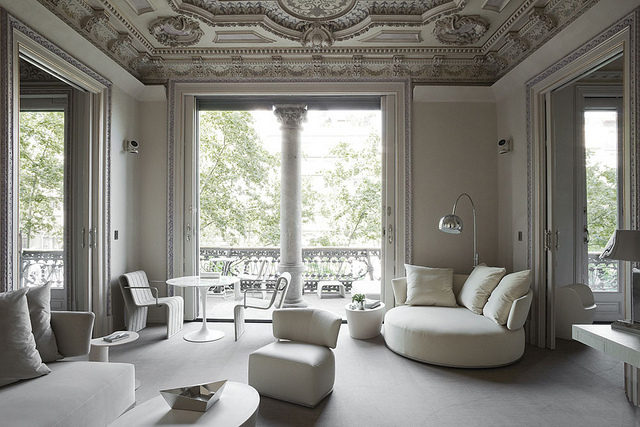 The six expansive ‘Modernista’ suites at El Palauet are situated just a short distance away from the beach in Barcelona, as well as the city’s other main attractions. The attention to detail is incredible, from the beautiful stained-glass windows to the fact that guests have access to a personal assistant who will try and make your stay as comfortable and memorable as possible. Each apartment has a living room, dining room, a balcony or a terrace, a modern kitchen and touchscreen controls to operate everything from the temperature to what music you want to be played over the state-of-the-art sound system. A spa, massage room and relaxation areas are also available on site. These eight distinctive studios are a brief tram journey from the centre of the stunning Italian city of Florence. The small complex has been open since 2006 and the interior design is elegant and sophisticated, which blend to make ‘a cross-sectional landscape for curious minds’, according to their publicity literature. Enjoy a message, a dip in the swimming pool, a round of golf or an afternoon’s horse riding in the surrounding areas. Visitors also get a complementary buffet breakfast and the use of bicycles to explore Florence on two wheels. La Manga is renowned for its world-class sporting facilities and the on-site apartments are also pretty special. One of the two-bedroom living spaces here comes complete with its own private pool and garden tucked away amid palm trees and luscious greenery. A large communal pool is also nearby along with tennis courts, while air conditioning will keep you cool in the Spanish sunshine. The built-in barbeque and large sun terrace make it ideal for a spot of al fresco dining, although if you fancy eating out there are some 25 restaurants and bars at La Manga. It’s hard to know where to start really, such is the high standard of these apartments set right in the heart of Westminster. The contemporary décor is crisp and sharp, the massive bathroom comes complete with two separate sinks and the bedrooms offer a calm retreat after a hectic day in London. On site, there’s also a Michelin-starred restaurant, a spa, an outdoor barbeque with an eating area and three bars.